Wow, I knew Kumasi had an issue with outdoor advertising billboards, banners, etc, but for it to reach the notice of Nigeria….. Well it has! If you’ve followed this blog, you know I have posted a lot on this problem over the years. 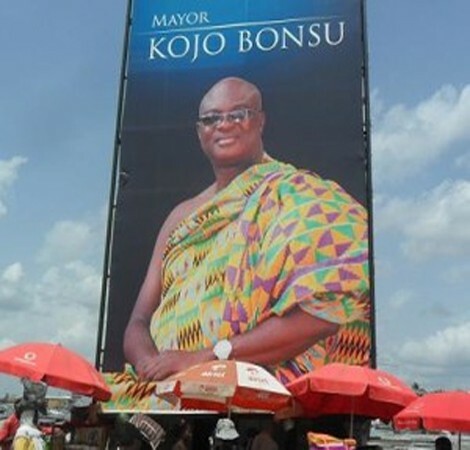 So when I saw the title of the article So Much Clutter In Outdoor Advertising In Ghana and clicked on it, I wasn’t at all surprised to see that all the photos were from….Kumasi. But reading the article, I was surprised to learn that there is a 100 m between signs regulation and that some cities in Nigeria have regulatory agencies to monitor the sign situation. Does Kumasi ever need that intervention. Now you might think that business is booming here in Kumasi….well, it isn’t! I would hazard a guess that more signboards advertise religious conferences/retreats/prayer camps etc. than products or services.